The king of Aram, Ben-Hadad, mobilized his entire army and attacked the Northern Kingdom besieging its capital Samaria. Probably the attack occurred around 850 B.C. when Joram was king of the Northern tribes. Elisha was still the main prophet in the Northern Kingdom and remained in Samaria during the siege. It last so long that a severe famine occurred in the city. People were starving. A donkey’s head sold for 80 shekels of silver and a quarter of a cab of seed pods for five shekels. One day as King Joram was walking the city wall, he learned that cannibalization was occurring in Samaria. Joram tore his robes and threatened to kill Elisha. We aren’t told the exact reason for Joram’s anger at Elisha; but, clearly Joram considered Elisha responsible for conditions in besieged Samaria. Perhaps, Elisha told Joram to hold out against the Arameans and that God would deliver the city. King Joram went to Elisha house where he confronted Elisha with “This disaster is from the Lord. Why should I wait for the Lord any longer?” (2 Kings 6:33). Elisha’s responded that by about this time tomorrow, the cost of grain would be much reduced; meaning the siege would be lifted. King Joram must have been reassured because he did not kill Elisha. In the siege of Samaria, the Bible used a quarter cab of seed pods to demonstrate how scarce food was in the city. In ancient Hebrew, a quarter of a cab was about 1 pint. During the siege, a pint of seed pods sold for five silver shekels; equivalent to about 2.62 ounces of silver. Today in the United State, silver sells for about $30.00 an ounce; therefore, one pint of pods was valued at $90.00. In ancient Israel, the value of a male child one month through five years of age was 5 silver shekels, while the value of a female child was 3 silver shekels (Leviticus 27:6-7). Both the King James Bible and the Revised Standard Version translated seed pods as dove’s dung. Many botanists and Bible scholars agree that the plant was the Ornithogalum umbellatum. Another popular name is the Star of Bethlehem because of the six petals on its flower. Dove’s dung seems like a distasteful name for this beautiful plant. Most likely the name “dove’s dung” came from Hebrew’s viewing large fields containing the white Star of Bethlehem flower in the spring. The small white flowers appeared like dove’s droppings from a distance. 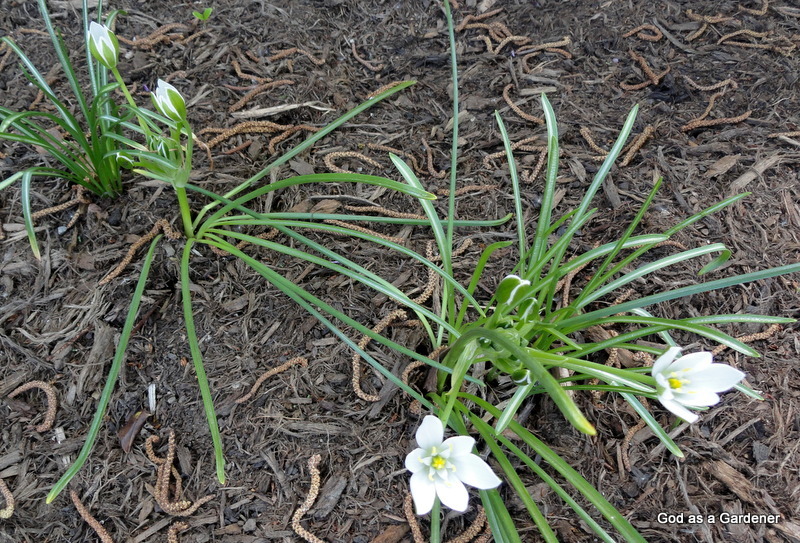 We planted Star of Bethlehem bulb in the Bible garden last fall. Now (in May) they are blooming. And yes, I do understand why they were called Dove’s dung when viewed from a distance. Flower stalks grow from below ground level and each produces a single flower. The edibility of Dove’s dung has generated much discussion. Reading the arguements, James Duke harvested a few of the bulbs from in his lawn (Duke, Duke, & duCellier, 2008). After boiling them vigorously without salt, he ate one. To Duke the bulbs tasted similar to soap and had a bitter aftertaste. He added salt and found that the boiled bulbs improved in taste. Because he experienced some shortness of breath following ingestion of only two bulbs, Duke concluded to eat the Star of Bethlehem he would need to be near starvation. Value is an assigned or computed numerical quantity, or something intrinsically desirable. In several places, Bible writers presented perspectives on what was valued and valuable. Moses regarded disgrace for the sake of Christ as more valuable than the treasures of Egypt (Hebrews 11:26). Israelite proverbs says that kings value a man who speaks the truth (Proverbs 26:28) and the husband of a wife of noble character lacks nothing of value (Proverbs16:13). Christ told the parable of a man who searched for just the right pearl (Matthew 13:46). When the man found the pearl of great value, he sold all his belongings and bought it. This parable can be compared to a person seeking truth and meaning in life. Once they find Christ, all possessions become secondary in value to following Christ. God considers his people valuable. Christ told his disciples to stop worrying about what they should eat or drink by using ravens as an example. Ravens are a fairly large, black bird with a shrill voice and aggressive manner. Ravens do not sow or reap, nor do they have storerooms or barns, yet, God feeds them. Christ reminded and reassured his disciples that they were more valuable to God than birds, and that God will meet their needs (Luke 12:24, 30-31). On another occasion, Christ’s teaching on what was valued and valuable was not meant to reassure. At the time Christ was teaching about trust using the parable of the shrewd manager (Luke 16:1-14). The Pharisees who loved money were listening and sneering at Jesus. Aware of their actions and hearts, Christ said to them, “what is highly valued (e.g., money) among men is detestable in God’s sight” (Luke 16:15). In another teaching, Christ likened money to a master or a god (Matthew 6: 24). He told his disciples that they cannot serve both God and Money. In Paul’s first letter to his beloved disciple Timothy, Paul reminded Timothy that “physical training is of some value, but godliness has value for all things” (1Timothy 4:8). Once we are born in Christ, we no long live a life characterized by sin (1 John 3:9). When we emulate Christ’s actions and obey God’s word, we train ourselves and God trains us to be godly. Being godly is intrinsically desirable; it is valuable both in the present life we live and most assuredly in the life to come (1 Timothy 4:8). Reflection. What is valuable to you? Do you value your spouse, children, career, or home more than God? Sometimes I worry that I value my husband more than my walk with God. Monitoring our priorities is a continuous process. The story of the siege of Samaria is found in 2 Kings 6:24-7:20. The king of Aram, Ben-Hadad, mobilized his entire army and attacked the Northern Kingdom besieging its capital Samaria. Aram was located directly north of the Northern Kingdom; Damascus was its capital. Probably the attack occurred around 850 B.C. when Joram was king of the Northern tribes. Elisha was still the main prophet in the Northern Kingdom and remained in Samaria during the siege. It last so long that a severe famine occurred in the city. People were starving. At donkey’s head sold for 80 shekels of silver and a quarter of a cab of seed pods for five shekels. One day as King Joram was walking the city wall, he learned that cannibalization was occurring in Samaria. Joram tore his robes and threatened to kill Elisha. We are not told the exact reason for Joram’s anger at Elisha; but, clearly Joram considered Elisha responsible for conditions in besieged Samaria. Perhaps, Elisha told Joram to hold out against the Arameans and that God would deliver the city. King Joram went to Elisha house where he confronted Elisha with “This disaster is from the Lord. Why should I wait for the Lord any longer?” (2 Kings 6:33). Elisha’s responded that by about this time tomorrow, the cost of grain would be much reduced; meaning the siege would be lifted. King Joram must have been reassured because he did not kill Elisha. In the siege of Samaria, the Bible used a quarter cab of seed pods to demonstrate how scarce food was in the city. In ancient Hebrew, a quarter of a cab was about 1 pint. During the siege, a pint of seed pods sold for five silver shekels; equivalent to about 2.62 ounces of silver. Today in the United State, silver sells for about $35.00 an ounce; therefore, one pint of pods was valued at $92.00. In ancient Israel, the value of a male child one month through five years of age was 5 silver shekels, while the value of a female child was 3 silver shekels (Leviticus 27:6-7). Both the King James Bible and the Revised Standard Version translated seed pods as dove’s dung. 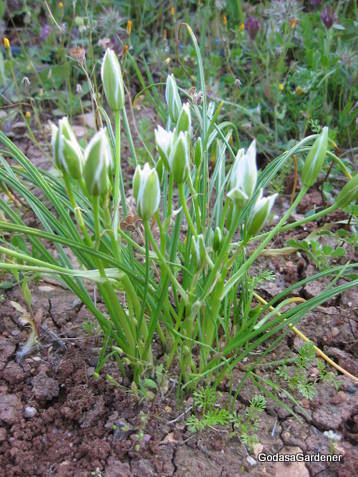 Many botanists and Bible scholars agree that the plant was the Ornithogalum umbellatum. Another popular name is the Star of Bethlehem because of the six petals on its flower. Dove’s dung seems like a distasteful name for this beautiful plant. Most likely the name “dove’s dung” came from Hebrew’s viewing large fields containing the white Star of Bethlehem flower in the spring. The small white flowers appeared like dove’s droppings from a distance. In temperate climates the plant blooms April to May. Flower stalks grow from below ground level and each produces a single flower. After flowering and producing seeds, the Star of Bethlehem remains dormant during the e summer heat. In autumn or cooler weather, bulbs reproduce underground. In the United States, the Star of Bethlehem is often considered an invasive weed being more difficult to control with herbicides than many other species of plants.